Introduction: The aim of this study was to determine the tooth occlusion pattern among the Niger Deltans in Nigeria. Materials and Methods: The study adopted an observational research design. This descriptive cross-sectional survey involved the use of data form and direct observation. The research involved 2304 subjects and multistage sampling; a complex form of cluster sampling was employed. Tooth occlusion pattern were classified following the fourfold models. Subjects were classified as having any of the following: edge to edge, mild overbite, severe overbite and negative overbite. Data obtained were subjected to statistical analyses using chi-square test, with the aid of the Statistical Package for the Social Sciences, version 18. P-value < 0.05 was considered significant. Results: The results of the study revealed the frequency of mild overbite as the highest (male = 26.13%, female = 25.39%) which was followed by edge to edge type of tooth occlusion (male = 16.28%, female = 18.75%). The incidences of both severe and negative overbite were observed more in males than females (P > 0.05). Conclusion: This research has elucidated human variability in the tooth occlusion pattern of the Niger Deltans. Dental occlusion refers to the contact between the teeth of the upper jaw (maxillary teeth) and the teeth of the lower jaw (mandibular teeth). The term Malocclusion means the teeth are not aligned properly which is most often hereditary. There are different categories of occlusion. According to Eveleth’s classification of tooth occlusion pattern (1972) the categories are: edge to edge which means the upper teeth and the lower teeth align to each other, mild overbite means the upper teeth slightly overlap the lower teeth and severe overbite is more overlap, negative overbite is when the lower jaw overlap the upper jaw. Tooth occlusion pattern was studied and classified in North Eastern Brazilians . Literature search reveals dearth of data on the distribution of tooth occlusion pattern in the Niger Delta Region in Nigeria. This study provides a comprehensive data for use in orthodontics, anthropology and forensic medicine. The aim of this study was to determine the tooth occlusion pattern among the Niger Deltans. The Niger Delta region consists of present-day Bayelsa, Delta, and Rivers States. The region also includes Abia, Akwa-Ibom, , Edo, Imo and Ondo States. There are about 31 million people of more than 40 ethnic groups including the Bini, Efik, Esan, Ibibio, Igbo, Annang, Oron, Ijaw, Itsekiri, Yoruba, Isoko, Urhobo, Ukwuani and Kalabari, among the inhabitants in the Niger Delta, speaking about 250 different dialects . The study area is Niger Delta and the study adopted an observational research design. This descriptive cross-sectional survey involved the use of data form and direct observation. The research involved 2304 subjects and multistage sampling; a complex form of cluster sampling was employed. Tooth occlusion pattern were classified following the fourfold models . Subjects were classified as having any of the following: edge to edge, mild overbite, severe overbite and negative overbite (figures 1to 4). Edge to edge occlusion pattern was the impression for an occlusion in which the incisal edges of the maxillary incisors meet the incisal edges of the mandibular incisors. 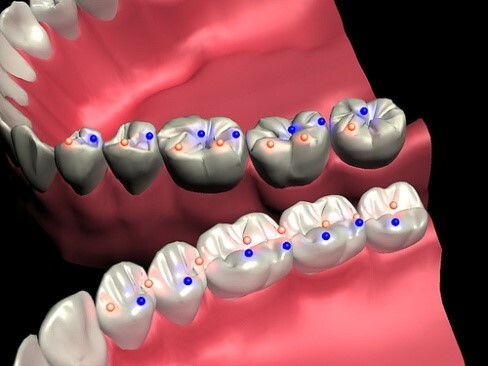 Mild overbite was the class when the upper anterior teeth overlap the lower anterior teeth creating a vertical overlap of the anterior teeth which is 2-3 millimeters. Severe overbite was defined when there was excess amount or percentage of vertical overlap of the lower incisors (greater than 3mm or 30% percent or 1/3 rd the clinical crown height of the mandibular incisors) by the upper incisors. Negative overbite was when the lower anterior teeth overlap the upper anterior teeth. The subjects with history or clinical presentation of pathological conditions, trauma or fracture of the jaw were excluded from the study. Table 1: The gender of the Niger Deltans. Table 2: The tooth occlusion pattern among the Niger Deltans. Table 2 revealed that the frequency of mild overbite type of tooth occlusion was found to be the highest which was followed by edge to edge bite. The negative overbite was rare among the participants. The gender difference in the tooth occlusion pattern among Niger Deltans was not significant (P > 0.05). The present study among the Niger Deltans in Nigeria saw the frequency of mild overbite as the highest (male = 26.13%, female = 25.39%) which was followed by edge to edge type of tooth occlusion (male = 16.28%, female = 18.75%). The incidences of both severe and negative overbite were observed more in males than females. This study concurred with one done among the Assamese Sikhs in India. They saw that the frequency of mild overbite type of tooth occlusion was found to be the highest (male = 44.90%, female = 54.00%) which was closely followed by edge to edge bite (male = 36.73%, female 32.0%). They noted that the incidence of negative overbite was observed more in males (16.33%) than females (10.00%). Their study revealed that severe overbite type was rare among them (male = 2.04%, female = 4.00%). They documented that bisexual variation had no significant differences (0.80 > P > 0.70) among them . The gender difference in the tooth occlusion pattern among the Niger Deltans was not significant (P > 0.05) just like the study done among the Assamese Sikhs . The Mishing tribals had a predominance of edge to edge bite of dental occlusion pattern and the bisexual differences observed were not significant. The percentage figures with regards to overbitting among them are much lower than the corresponding figures observed in this study . The different studies compared and discussed above portrayed differences in the tooth occlusion considered. There may be reasons for this such as racial origin, methodology and age. This research has elucidated human variability in the tooth occlusion pattern of the Niger Deltans. Sandeep G., Sonia G. (2012). Pattern of Dental Malocclusion in Orthodontic Patients in Rwanda: A Retrospective Hospital Based Study. Rwanda Medical Journal, 69 (4): 13-18. Vegesna M., Chandrasekhar R., Chandrappa V. (2014). Occlusal Characteristics and Spacing in Primary Dentition: A Gender Comparative Cross-Sectional Study. International Scholarly Research Notices, 2014. Onyeaso C.O., Sote E.O. (2002). A study of malocclusion in the primary dentition in a population of Nigerian Children. Nigerian Journal of Clinical Practice, 5 (1): 52-56. CRS Report for Congress, Nigeria: Current Issues. Updated 30 January 2008. Singh J., Sengupta S. (2004). Some Morpho-genetic and Behavioural Traits among the Assamese Sikhs. Anthropologist, 6 (4): 253-255. Sengupta S. (1993). Physical Anthropology of the Koch Population of North East India. Mittal Publications, Delhi.